Rocket Fuel is a Wickman follow up to Get a Grip, albeit with a different co-author (or perhaps integrator). 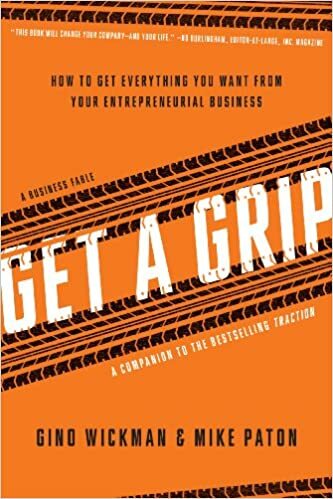 Where Get a Grip was broad and inclusive to the entrepreneurial organization as a whole, Rocket Fuel is narrow and focused on one thing, the relationship between the Visionary and the Integrator. We will spend more time defining those two terms in a moment but these are basically the top two spots at a company and when these top spots are in sync, you get magic. When they’re not, you get garbage. This book teaches how to get these two players playing the same game. Our authors start by defining the players. The first is our Visionary. The Visionary is typically, but not always, the founder of the company but they play the role of idea guy. They have twenty ideas a day if not more. Most of these ideas stink but one or two are brilliant. They have the passion and the drive. Or as our authors put it, they are most commonly the, “Entrepreneurial spark plug, Inspirer, Passion Provider, Developer of new/big ideas/breakthroughs, Big problem solver, Engager and maintainer of big external relationships, Closer of big deals, Learner, researcher and discoverer, Company vision creator and champion.” These are fun people to be around because they pick you up when you’re feeling down and make you see things their way. What they are typically NOT so good at are the details. They don’t pride themselves on the day to day nor do they do a great job of following up. They are not finishers, they are starters. One of the primary reasons the book was written is that the dynamos known as Visionaries quickly become disillusioned and frustrated once their business starts becoming successful because they run into what our authors call the “Five Frustrations: 1. Lack of Control. You started this business so you could have more control over your time, money and freedom-your future. Once you reach a certain point of growth, however, you realize that somehow you actually have less control over these things than you’ve ever had before…2. Lack of Profit. Quite simply you don’t have enough…3. Nobody (employees, partners, vendors) seems to understand you or do things your way. You’re just not on the same page. 4. Hitting the Ceiling. Growth has stopped. The business is more complex, and you can’t figure out exactly why it isn’t working. 5. Nothing is working. You’ve tried several remedies, consulted books, and instituted quick fixes….you have no traction.” At some point of growth this seems to be the fate of almost every Visionary. Enter the Integrator, stage right. The Integrator is the yin to the Visionary’s yang. The Integrator “harmoniously integrates the major functions of the business, runs the organization, and manages the day-to-day issues that arise. The Integrator is the glue that holds the people, processes, systems, priorities, and strategy of the company together.” One obvious trait of the Integrator is communication but more importantly they play the role of filter to the “Visionary’s ideas, which helps to eliminate hurdles, stumbling blocks, and barriers for the leadership team.” This is not the easiest pill to swallow because it also means that the Integrator has to challenge these ideas and put the grit of reality into the purity of the Visionary’s dream. This means having to say no. A lot. To your boss. This means a ton of work with very little of the glory. It means being the man behind the Man (or woman in either case). So, who the hell would sign up for that job? Turns out, you don’t have much of a choice. You’re either wired this way or you’re not. If you are, you loooove to see stuff done right. And you’re the one making sure it’s happening. Glory means less than success to the Integrator. Discipline and accountability trump all. How you get these two very different people together and working effectively is the content of the rest of the book. It all starts with the accountability chart. If you read Get a Grip, this is a bit of a review but still a salient point because of how important it is to get the accountability breakdown correct. An accountability chart is an org chart on steroids. It is done on a role based methodology, where you diagram all of the roles that a team needs to succeed and only then put your people in those roles. In most cases people play multiple roles but even then it becomes clear for what each person is held accountable. Most organizations do this backwards where they will build the org chart around the people they have instead of the roles and create a broken, convoluted reporting structure. They reemphasize the point that more than one person can’t be accountable for something because then nobody is accountable. I love that maxim. The focus in this book is more on the accountability trade off between our top two and how important it is to define who is going to handle what. They also make the point that the rest of the leadership team reports to the Integrator but that the Integrator reports to the Visionary. This has the caveat though that if the visionary is wearing multiple hats, like VP of sales and marketing, when playing that role, they do in fact report to the Integrator. Accountability brings us to the five rules that Wickman and Winters lay out for this relationship: “1. Stay on the same page 2. No End Runs 3. The Integrator is the Tie Breaker 4. You Are an Employee When Working “in” the Business 5. Maintain Mutual Respect.” These are great rules of thumb because it starts to assist the Visionary in giving up some of the control and hassles of the business. This is an underlying theme throughout the book that all of this will fail unless the Visionary is truly ready to give up some of the responsibilities of running the business. According to our authors this is one of the main reasons the relationship fails, Visionary readiness. One of the last interesting stats they throw at us before closing the book is that about 22% of people out there have the capacity to become a Visionary where only about 5% are wired to be an Integrator. This creates a 4:1 gap making strong Integrators very much in demand. If the Visionary can find a good one and put these elements in place, add a dash of productive tension, that’s when you go from gasoline to rocket fuel. Only then is the business ready for lift off. Wickman and Paton wrote a business book that reads like a novel. In this business novel, they introduce what they call the entrepreneurial operating system via a fable about a struggling services company that is on the daily brink of implosion. This company is talked into hiring a consultant that comes in and turns the ship around using this EOS system. The story is just a medium for passing on a wealth of business knowledge, which you can also get from the companion book, Traction: Get a grip on your Business which, from what I understand comes sans story. There is a lot of excellent advice within these pages but what I found most useful about the book is that it provides a complete system to running a business well. This is a stark contrast from most books in the genre which typically focus on only one aspect of the business or in many cases one person’s opinion on one aspect of the business. This book lays the framework that not only gives you the whole enchilada but teaches you how to cook it. Our fictional team then started to get into the heart of getting stuff done. They listed out all of their big ‘rocks’ or those things that were important to deal with in the team and their consultant led them through a stimulating session of ‘keep, kill and combine’ to prioritize the ones that had to be dealt with first. He also throws a warning out there that all rocks that folks were signing up for had to be, “SMART – specific, measurable, attainable, realistic, and timely.” This turned into a quarterly rock sheet that would be reported on in their level 10 meeting every week. The concept of the level 10 meeting was another good one, these are very directed meetings focused on solving real problems following the EOS methodologies. The level 10 comes from making sure each meeting is rated a 10 in the last 5 minutes at the end of each meeting. He put forth a strong agenda for these meetings: Segue (good news – personal and biz), scorecard review, rock review, customer and employee headlines, to do list, IDS (Issues list), conclude (recap to dos, cascading messages, rating 1-10). The key to most of these was that everything but the IDS is a 5 minute task, if something is off track you drop it down to the issues list and deal with it there. IDS stand for identify, discuss and solve and this is the core of productive meetings, solving these issues for good rather than circling around them again and again and never coming to a conclusion. To make these level 10 meetings as effective as possible, he also called out timeliness. These things have to become a high priority and the leadership team needs to treat them that way. Our authors even used a Lombardi quote stating that if your on time, you’re late. Everyone needs to come to these meetings prepared, early and ready to work. They got deeper into personnel issues next. The challenge they gave themselves was discovering their own Core Values. He asked them to start this process by first calling out the superstars in the organization, those people that really fit the culture and if you had more of them you could conquer the world. He calls out the most important core values as the, “Permission to play Core Values are traits essential to this organization. You will never hire someone without these traits, and you’ll ask people to leave the organization when you learn they don’t possess them.” Our consultant segues from Core Values to Core Focus, “Core Values define who you are, Core Focus defines what you are…your 10-year Target is where you’re going. It’s a long range, energizing goal that everyone will rally around.” The tool that I liked the best that came out of this was the people analyzer. The people analyzer asked the leadership team or just the manager to directly compare employees to their core values. In our fictional team’s example this was five values and if the person is below the bar on any of those five values, they get their strike one meeting. The employee gets a very candid review of where they are below the bar and what they need to do to change. If they get to three strikes, they are let go. They go on into more strategic elements next of the three year plan, the one year plan and the quarterly check ups. What I enjoyed most about all of these tools is that they are well defined and not just abstract concepts. The authors give you a set of blueprints that you need to fill in on your own taking you to a much stronger business. Well worth the read. I heard about the book from an advisory board that I sit on and several of the CEOs there swear by it. These are big players and if it can help their business, it can probably help yours too. My plan is to move on to the companion novel, Traction, next.